I visited tourist spots in Atami City. 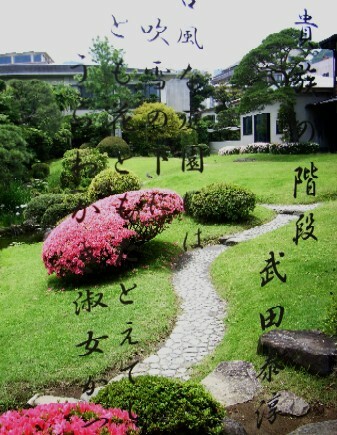 The villa has a central location in the city and features a beautiful Japanese garden. This cultural asset was known as a country house of renowned businessmen. It was first built by Shinya Uchida (内田信也, called “a shipping magnate”) in 1919 and owned by Kaichiro Nezu (根津嘉一郎, called “a railroad king”) from 1925 to 1944. 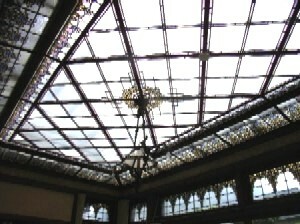 Then, it became a luxury Japanese inn in 1947. After the inn closed in 1999, the city government owns and opens the villa to the public. Each owner remodeled and made an extension to Kiunkaku, and the villa consists of buildings in several styles: purely Japanese, Western and contemporary architecture. On the whole, it’s a fine compromise between East and West. 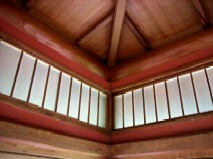 Among its Japanese architectural elements, I liked colored plaster walls. 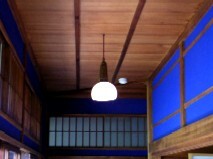 The ultramarine and bright red walls were modeled on those of traditional architecture in Kaga (present day Ishikawa Prefecture) in the Edo period. The walls make the room modern though it’s difficult to show the atmosphere by the pictures. If I have a chance to make a Japanese room in the future, I’ll borrow the idea. 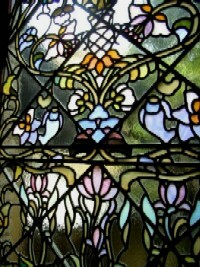 As for its Western elements, stained-glass windows and roofs were beautiful. The villa shows another side of city's character. 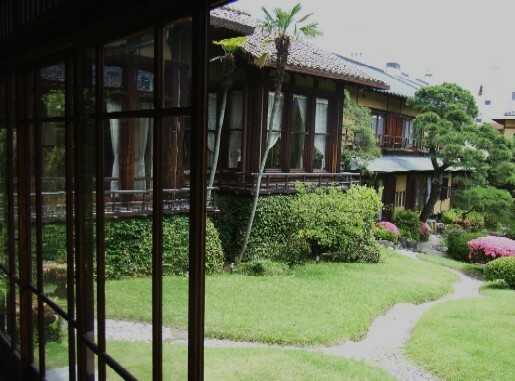 Atami was loved by Japanese great literary figures, and many novelists stayed at Kiunkaku for writing: Youzo Yamamoto (山本有三), Naoya Shiga (志賀直哉), Junichiro Tanizaki (谷崎潤一郎), Osamu Dazai (太宰治) and Taijun Takeda (武田泰淳). The writing on the window glass is a writer’s name, a title of his novel that was written in this room and the line from the novel. Even in modern times, a lot of cultural figures like the town. He lived (lives?) in Oiso (大磯), a seaside town located between Tokyo and Atami. That should be a nice an hour drive along the coast.